Liftoff of the ExoMars 2018 rover mission currently under development jointly by Europe and Russia has just been postponed for two years to 2020, according to an announcement today, May 2, from the European Space Agency (ESA) and the Russian space agency Roscosmos. The delay was forced by a variety of technical and funding issues that ate up the schedule margin to enable a successful outcome for what will be Europe’s first Mars rover. The goal is to search for signs of life. “Taking into account the delays in European and Russian industrial activities and deliveries of the scientific payload, a launch in 2020 would be the best solution,” ESA explained in a statement today. The ambitious ExoMars rover is the second of two joint Euro-Russian missions to explore the Red Planet. It is equipped with an ESA deep driller and a NASA instrument to search for preserved organic molecules. The first mission known as ExoMars 2016 was successfully launched last month from the Baikonur Cosmodrome in Kazakhstan atop a Russian Proton-M rocket on March 14. The renamed ExoMars 2020 mission involves a European-led rover and a Russian-led surface platform and is also slated to blastoff on an Russian Proton rocket. Roscosmos and ESA jointly decided to move the launch to the next available Mars launch window in July 2020. The costs associated with the delay are not known. The delay means that the Euro-Russian rover mission will launch the same year as NASA’s 2020 rover. The rover is being built by prime contractor Airbus Defense and Space in Stevenage, England. The descent module and surface science package are provided by Roscosmos with some contributions by ESA. Recognizing the potential for a delay, ESA and Roscosmos set up a tiger team in late 2015 to assess the best options. “Russian and European experts made their best efforts to meet the 2018 launch schedule for the mission, and in late 2015, a dedicated ESA-Roscosmos Tiger Team, also including Russian and European industries, initiated an analysis of all possible solutions to recover schedule delays and accommodate schedule contingencies,” said ESA in the statement. The tiger team reported their results to ESA Director General Johann-Dietrich Woerner and Roscosmos Director General Igor Komarov. The ExoMars 2016 interplanetary mission is comprised of the Trace Gas Orbiter (TGO) and the Schiaparelli lander. The spacecraft are due to arrive at Mars in October 2016. The goal of TGO is to search for possible signatures of life in the form of trace amounts of atmospheric methane on the Red Planet. The main purpose of Schiaparelli is to demonstrate key entry, descent, and landing technologies for the follow on 2nd ExoMars mission that will land the first European rover on the Red Planet. The now planned 2020 ExoMars mission will deliver an advanced rover to the Red Planet’s surface. It is equipped with the first ever deep driller that can collect samples to depths of 2 meters (seven feet) where the environment is shielded from the harsh conditions on the surface – namely the constant bombardment of cosmic radiation and the presence of strong oxidants like perchlorates that can destroy organic molecules. 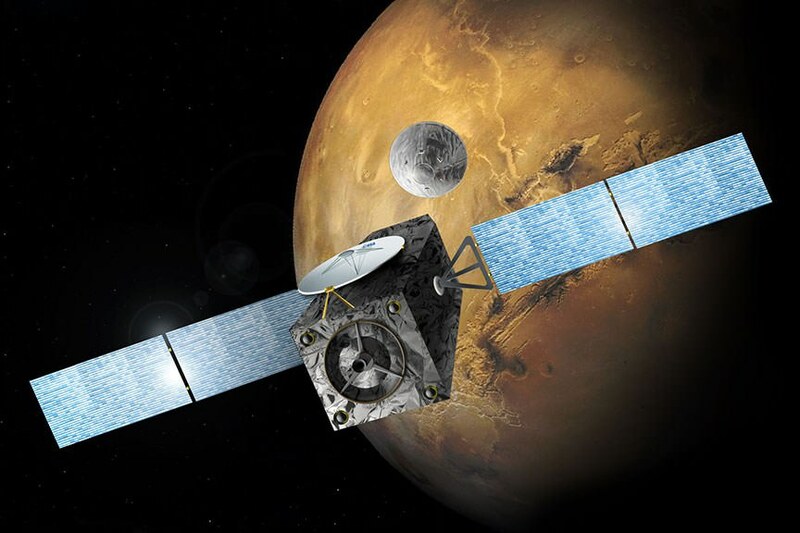 TGO will also help search for safe landing sites for the ExoMars 2020 lander and serve as the all important data communication relay station sending signals and science from the rover and surface science platform back to Earth. NASA’s renowned Mars rover Opportunity has been spied anew in a fabulous new photo captured just days ago by NASA’s ‘Spy in the Sky’ orbiter circling overhead the Red Planet. See Opportunity from above and below – from today’s location. See orbital view above – just released today. The highly detailed image was freshly taken on Feb. 14 (Valentine’s Day 2014) by the telescopic High Resolution Imaging Science Experiment (HiRISE) camera on NASA’s Mars Reconnaissance Orbiter (MRO) as the decade old Opportunity was investigating the tasty alien terrain on ‘Murray Ridge’ – nearby the celebrated ‘jelly doughnut’ rock by the summit of Solander Point. See surface views below. The fabulous orbital image shows not only rover Opportunity at her location today, but also the breathtaking landscape around the robots current location as well as some of the wheel tracks created by the Martian mountaineer as she climbed from the plains below up to near the peak of Solander Point. Murray Ridge and Solander Point lie at the western rim of a vast crater named Endeavour that spans some 22 kilometers (14 miles) in diameter. Endeavour is an impact scar created billions of years ago. See our 10 Year Opportunity traverse map below. To help solve the mystery of the origin of the shiny 1.5 inches wide (4 centimeters) ‘jelly doughnut’ rock, dubbed ‘Pinnacle Island’, the science team decided to enlist the unparalleled capabilities of the HiRISE camera and imaging team in pursuit of answers. ‘Pinnacle Island’ had suddenly appeared out of nowhere in a set of before/after pictures taken by Opportunity’s cameras on Jan, 8, 2014 (Sol 3540), whereas that exact same spot had been vacant of debris in photos taken barely 4 days earlier. And the rover hadn’t budged a single millimeter. So the HiRISE research team was called in to plan a new high resolution observation of the ‘Murray Ridge’ area and gather clues about the rocky riddle. The purpose was to “check the remote possibility that a fresh impact by an object from space might have excavated a crater near Opportunity and thrown this rock to its new location”- now known as Pinnacle Island, said NASA in a statement. Well, no fresh crater impacting site was found in the new image. “We see no obvious signs of a very recent crater in our image, but a careful comparison to prior images might reveal subtle changes,” wrote HiRISE principal investigator Alfred McEwen in a description today. In the meantime, as I reported here a few days ago the mystery was solved at last by the rover team after Opportunity drove a short distance away from the ‘jelly doughnut’ rock and snapped some ‘look back’ photographs to document the ‘mysterious scene’ for further scrutiny. It turns out that the six wheeled Opportunity unknowingly ‘created’ the mystery herself when she drove over a larger rock, crushing and breaking it apart with the force from the wheels and her hefty 400 pound (185 kg) mass. “Murray Ridge” and the Solander Point mountaintop are of great scientific interest because the region is riven with outcrops of minerals, including clay minerals, that likely formed in flowing liquid neutral water conducive to life – potentially a scientific goldmine. Today, Feb 19, marks Opportunity’s 3582nd Sol or Martian Day roving Mars. She is healthy with plenty of power. So far she has snapped over 188,800 amazing images on the first overland expedition across the Red Planet. This image from the panoramic camera (Pancam) on NASA’s rover Opportunity shows the location of a rock called “Pinnacle Island” before it appeared in front of the rover in early January 2014. Arrow at lower left. This image was taken during Sol 3567 of Opportunity’s work on Mars (Feb. 4, 2014). Credit: NASA/JPL-Caltech/Cornell Univ./Arizona State Univ. Weekly Space Hangout – January 24, 2014: LEGO Mars Rover & the Supernova We Missed in the Star Party! Special Guests: Stephen Pakbaz, designer of the LEGO Mars Rover Kit, and Ray Sanders from CosmoQuest, who is unboxing and building the kit as we hang out! One of the most successful mission ever sent to Mars is the Mars Exploration Rover program, with the two rovers Spirit and Opportunity. 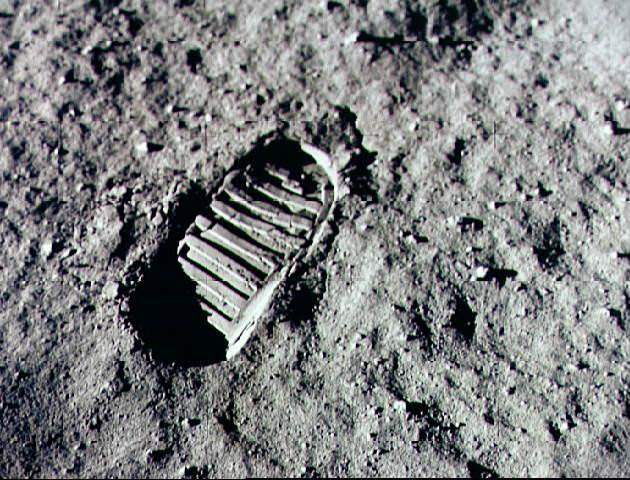 They were launched separately to Mars in 2003 and landed safely several months later. They were supposed to last about 3 months on the surface of Mars, but have now survived more than 5 years. Spirit and Opportunity used technology developed with the Mars Pathfinder mission. They used an airbag system to land on the surface of Mars without using retrorockets to touch down gently. They also use the rover technology first used with the Sojourner rover, but instead of operating from a base, Spirit and Opportunity were designed to be completely independent, able to communicate directly back to Earth. The purpose of the Mars Exploration Rover mission (MER) was to search the surface of Mars for evidence of past water on the surface of Mars. Spirit landed in the huge Gusev Crater on Mars, a region that could have been an ancient lake on Mars. Opportunity touched down on the other side of the planet in a region called Meridiani Planum. Both Spirit and Opportunity are equipped with solar panels that supply electricity to let them crawl around the surface of Mars, as well as their scientific instruments that let them study the surface of Mars and its rocks. They’re also equipped with a grinding tool that lets them scrape away the outer layer of rocks and see the material underneath. Within just a few months of arriving on Mars, both Spirit and Opportunity fulfilled their mission objectives, and discovered evidence that large quantities of water used to be on the surface of Mars. Spirit discovered hints that water had acted on a rock called Humphrey, while Opportunity found layers of sedimentary rock that would have been formed by deposits in water. Both rovers continued to find additional evidence for the presence of water. Over the course of their mission on the surface of Mars, both rover traveled several kilometers. Spirit climbed a small mountain, and Opportunity crawled into a large crater to sample the walls for evidence of past water. And both rovers continued to perform quite well, for many years beyond their original estimate life spans. We have written many articles about the Mars Exploration Rovers for Universe Today. Here’s an article about the troubles for the Spirit rover, and here’s an article about Martian weather. If you’d like more info on the rovers, you should check out the Mars Exploration Rover homepage from NASA. We’ve also recorded several episodes of Astronomy Cast about the exploration of Mars. Start here, Episode 92: Missions to Mars, Part 1. Amazingly, the two Mars rovers, Spirit and Opportunity, have been working diligently on the surface of the Red Planet for almost four years now. So far, Opportunity has grabbed most of the spotlight, finding evidence for past water on Mars within months after landing on the smooth plains of Meridiani Planum. While Spirit has been working just as hard, if not harder, climbing hills and traversing the rocky terrain of Gusev Crater, she hasn’t yet caused quite the stir that her twin has. But now, a recent discovery by Spirit at an area called Home Plate has researchers puzzling over a possible habitat for past microbial organisms. What Spirit found is a patch of nearly pure silica, a main ingredient in window glass. “This concentration of silica is probably the most significant discovery by Spirit for revealing a habitable niche that existed on Mars in the past,” said Steve Squyres, principal investigator for the rovers’ science payload. The silica could have been produced from either a hot-spring type of environment or another type of environment called a fumarole, where acidic steam rises through cracks in the planet’s surface. On Earth, both of these types of environments teem with microbial life. Squyres said the patch that Spirit has been studying is more than 90 percent silica, and that there aren’t many ways to explain such a high concentration. One way is to selectively remove silica from the native volcanic rocks and concentrate it in the deposits Spirit found. Hot springs can do that, dissolving silica at high heat and then dropping it out of solution as the water cools. Another way is to selectively remove almost everything else and leave the silica behind. Acidic steam at fumaroles can do that. Scientists are still assessing both possible origins. One reason Squyres favors the fumarole story is that the silica-rich soil on Mars has an enhanced level of titanium. On Earth, titanium levels are relatively high in some fumarolic deposits. Meanwhile both rovers are hunkering down for another winter season on Mars. Spirit’s solar panels are currently coated with dust from the huge dust storm the rovers endured this summer, and Spirit will need to conserve energy in order to survive the low light levels during the winter. I’m keeping my fingers crossed for another solar panel cleaning windstorm event, which has happened previously, giving the rovers a boost in power.